His parents were Michael and Mary Carney. He lived in Milford St Mold. 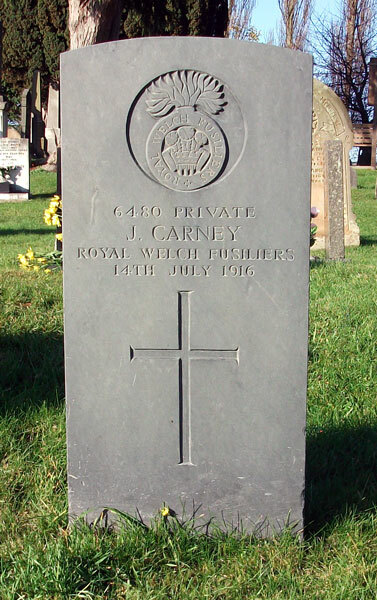 The Register of Soldiers’ Effects accessible on www.ancestry.co.uk in which the army calculated what moneys were owed to deceased soldiers, includes an entry for John Carney. It confirms the regimental details as at the top of this page and that he died of heart Disease. A total of £7 ..7sh ..1d was paid to his brother Martin in two separate payments. The census of 1911 records a Martin Carney living in Milford Street in Mold. He was 58 and single and worked as a cowman on a farm. he had been born in Ireland. He was Head of the household which also included Sarah Jackson 50 and Edward Jackson 51 as boarders. On census night there were two other Jacksons listed as Visitors Edward was 23 and Elizabeth was 14. It is speculation but I believe this Martin Carney is John’s brother. John was not listed.